Butler’s women’s track team in action at a meet. Collegian file photo. The Bulldogs competed in Seattle and Bloomington this weekend, with a snowstorm in Washington cutting the Husky Classic down to one day. On the men’s side, redshirt junior Euan Makepeace ran the 5000-meters in a time of 14:01.72, which placed him 21st overall. He is now fourth all-time in the Butler record book for the indoor event. Redshirt senior Johnny Leverenz ran a 4:06.81 in the mile, which placed him 22nd overall. This was also a season best. The women’s side was highlighted by junior Josephine Thestrup. Thestrup ran the mile in 4:45.13, which was good for 13th place. She was .22 seconds behind her personal best. In Bloomington, the Bulldogs had a stellar day. Sophomore Rebecca Collester ran two personal bests. In the 60-meters, Collester ran an 8.02. In the 200-meters, she ran a 25.70. The 400-meters proved strong for the Bulldogs. Sophomore Lily Hess finished with a 1:00.25, while junior Madeline Miller finished in 1:00.52. Their teammate, freshman Angela Neddeau, finished with a 1:00.97. The trio finished fifth, sixth and eighth respectively. 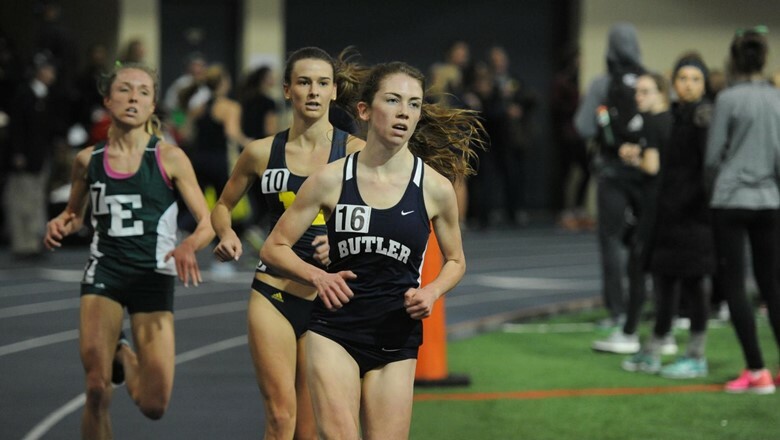 Junior Kara Stark finished sixth overall in the 3000-meters with a time of 10:25.69. Redshirt junior Eric Baugh finished second overall in the mile with a time of 4:09.27. In the men’s 200-meters, sophomore Jacob Uhl ran a 22.51 which was good for eighth. Junior Colton Haymon finished tenth overall with a 22.92. In the field events, redshirt junior Sam Robinson set a season-best in the long jump and a personal best in the high jump. His long jump mark of 6.80 meters put him in third overall. His high jump, 2.00 meters was good for fourth. Junior Wade Walder set a personal best in the pole vault with a mark of 4.58 meters. This was good for fifth. Sophomore Niki Ezeh had a personal best in the shot put with a distance of 13.73 meters, which placed her seventh. The Bulldogs will compete again next weekend. A portion of the team will head to Charleston, Illinois to compete in the Friday Night Special while others head to South Bend for the Alex Wilson Invite.